Upper Deck released a set called Century Legends during the 1999-2000 season. 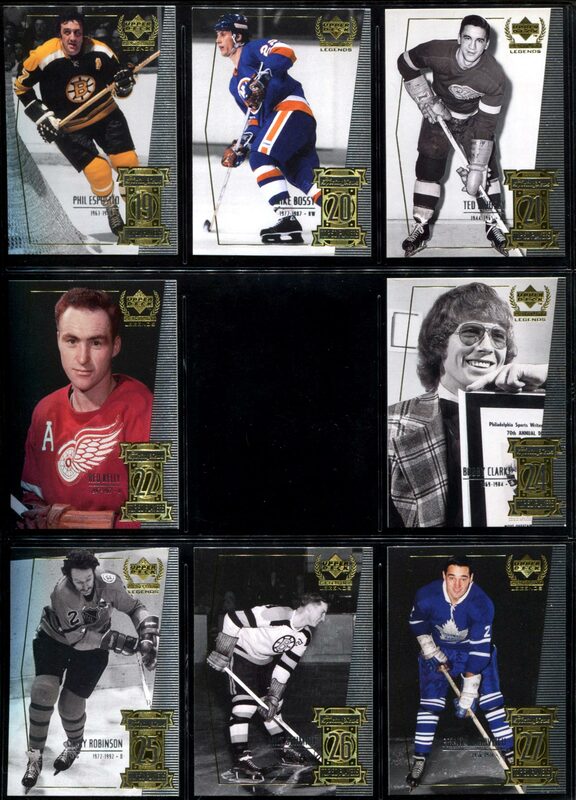 The first 50 cards of the 89-card set featured the top 50 NHL players of all time, as selected by The Sporting News. Absent from the set was number 23 on that list – Ken Dryden. Not only was Dryden omitted from the set, but the set skips card number 23, going from 22 to 24. 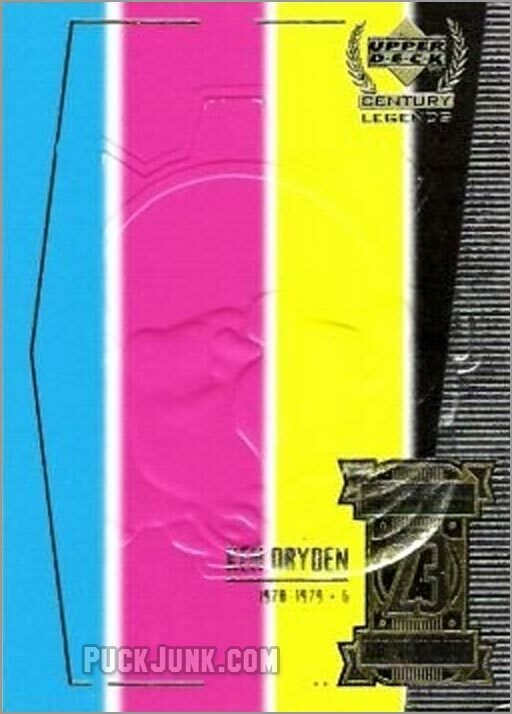 Dryden’s card was never made. Or was it? 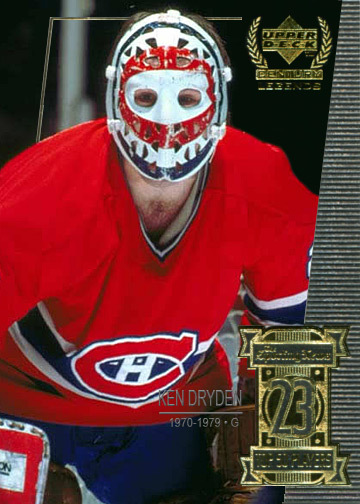 Technically, a Ken Dryden card was printed during the production of Century Legends. But no photo of the goalie was used. Instead, the card was printed with cyan, yellow and magenta bars in lieu of a photograph. The card was also embossed with a “gear graphic” from one of Upper Deck’s racing sets, so as to “destroy” the card. The bright colors would make the card easy to spot once the cards were cut apart, and subsequently removed before being put into packs. According to The Charlton Standard Catalogue of Hockey Cards, “a handful of these deformed cards made it into packs.” One source confirms that at least 5 of them have been sold on eBay. So, why was Ken Dryden not a part of this set? The most popular (and most likely) reason is that Upper Deck and Dryden could not come to an agreement. But what was the sticking point? Could it have been money? Perhaps not, as Dryden does appear in the Upper Deck Retro set, also issued that year. So money might not have been an issue here. Maybe Dryden was upset that he was ranked 4th among goaltenders, behind Jacques Plante, Terry Sawchuk and Glenn Hall, and wanted to be no part of The Sporting News’ Top 50. Why else would he agree to be in one card set but not the other? The 1999-00 Upper Deck Retro set also has cards of Plante, Sawchuk and Hall, but not in any particular ranking order. No matter his reason, it is a shame that Drydent was not a part of the Century Legends set. 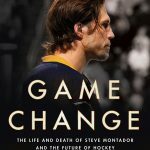 This set has all of the big names: Gretzky, Lemieux, Orr, Howe, Plante, Beliveau, Hull, Clarke, Bossy; a venerable “who’s who” of the NHL’s first 80 years. Dryden’s exclusion makes this set feel forever incomplete. I am not sure what type of photo Upper Deck would have used, but here is a custom card of what Dryden’s Century Legends card could have looked like. That wraps up the last part of The Lost Cards, at least for now. I hope to have another 5 installments sometime in July. So, what did you think? Did you learn anything from my hours of endless obsessing research? Can you think of any cards that should be featured in a future article? From what I’ve read, Dryden doesn’t even want to do public signing appearances. I heard Frozen Pond once offered him a lot of money to do an autograph signing session at his store, and he refused. So he seems like the kind of guy who would do things – or not do things – out of a matter of principle. I loved this series and I would really like to see another 5!! I read that Dryden doesn’t like people making money off his career. So that would include card companies and paid signings and I guess himself, since he would could make some serious coin by even just doing a single paid signing here and there. That’s why his ITG cards don’t have any pictures on them, since they can’t use his likeness. I think there is a story behind the UD retro card as well, whether it had his approval or not. Did Retro release before Legends? I do have one of these cards that I purchased on E-Bay and was fortunate to have it now in my possession. It would be nice if Upper Dec and Ken Dryden would come to a mutual agreement. If it is true that he would like to have been mentioned as number one but these were different era’s of the different goalie’s. To me I am a Habs fan and for a player to play in such a short time frame and accomplish what he has done in my books I rank him number one. This is my own personal opinion. Thanks for your comment. 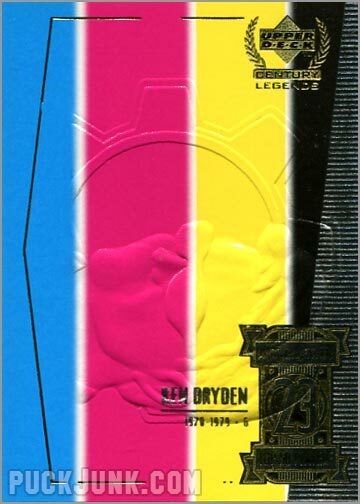 Would you be willing to share front and back scans of your “Dryden” card with this blog? Personally, I have never seen the back of this card. Let me get back to you when I have this done I am fairly new with all these technical apps on this computer. You did not print you e-mail address for me to send to you. If you can send scans at 144 dpi (or higher if you know how), then I can post them here to make this article even more comprehensive for other readers. I will be sure to give you credit for the photos, too. Any idea what that card would be worth? Great – love the custom card of Dryden ! 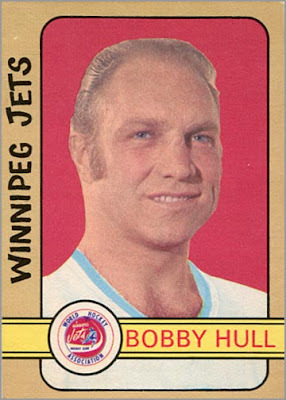 He was one of my favs on the 1970’s Habs dynasty. Thank for taking the time to make one and share it. Never received an answer to my question. Was there every a replacement card printed and if so can we purchase it. A replacement card was never printed. These posts are awesome. Keep them coming. I once owned one of these beauties, but I got caught up in the EBay rush and sold this true gem (which I never thought I would do!) I put up a crazy starting price and in a few hours someone bagged it. I have a different appreciation for Dryden as a Bruins fan- I watched him miraculously play his position verses The high scoring B’s teams of the early 70’s with Orr, Espo, Hodge, Bucyk extra…He’s the best I ever saw (with apologies to Bernie Parent) and can’t imagine someone better. One thing about him in the card industry-he doesn’t need the money like so many old timers do.That may be the reason he doesn’t sigh very often! I’m just getting into hockey so I’ve never seen this before, but I am a NASCAR collector and it’s strange to see the gear design embossed on the card here…. because it was not embossed on the NASCAR card! The NBA set is also missing a player but I can not remember who. The number 23 card does have Nascar impression on it. Jeff Gordon. It is blue, pink, yellow and black corner. Very cool card for a hockey card. Send me a text message and I can send you a picture. I have been looking for this Card for 25 years. 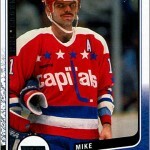 1994-95 Upper Deck Electric Ice #244 Brian Savage. Was it made and where can I but it? I would suggest regularly checking Ebay, COMC and the Beckett Marketplace until a copy for sale shows up.